Our client was a specialist music magazine called re:spect. The magazine’s slogan was ‘Every page of re:spect is about music’. We wanted to demonstrate the truth of this in a way that would attract new readers. First we launched a recruitment campaign in magazines and facebook groups, asking for ideas about how to make music from a piece of paper. Participants could use any part of re:spect magazine – tear out a page, rip it, scratch it, blow it, tap it or do whatever they could think of to create sounds from the paper. Readers were invited to show their ideas in a video and send it to re:spect. The best workable ideas would be used for a live “Paper Music Concert” which re:spect would organize and film as a viral video to spread via the Internet. Following the recruitment campaign, the re:spect facebook page was flooded with requests for details of the project. Music lovers kept uploading creative videos to the group page provoking a torrent of comments. The 35 selected performers in the viral video drew a massive responses from the social networks. More than 16,000 “likes” were recorded on facebook. It also aroused the interest of the mass media, attracted support from artists and singers and gained hundreds of new readers for the magazine! Hong Kong is a tough place for music lovers. There are lots of music magazines, but they’re all just packed with gossip about pop stars, with nothing about actual music. Fortunately there is one magazine that respects real music and real music lovers. Of course, it's called re:spect. ‘Every page is about music’. That’s their motto and they live up to it. Our objective was to let music lovers know about this magazine and encourage them to become readers. 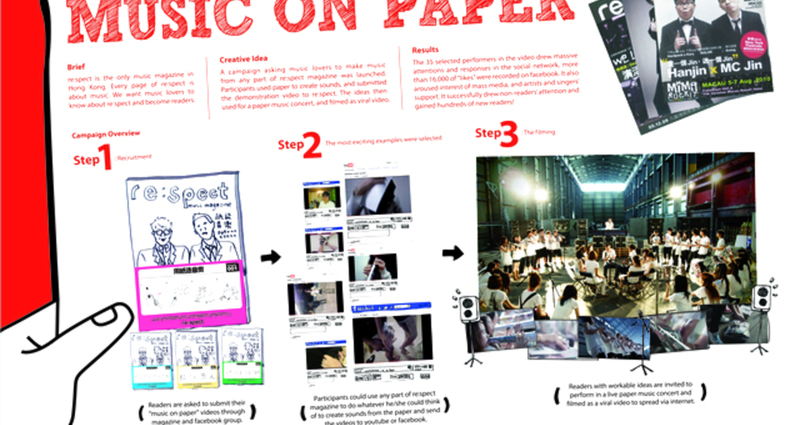 The main challenge appeared in the Music Video shooting stage. The paper-players are the readers themselves, we needed to give them sufficient practice and clear guidance.